Schedule an go to contact page. "GRATITUDE is RECOGNIZING L O V E !" Angela is profound .....also has cleared away blocks so I can move on with things that are right for me. Angela has a very special gift to share in helping us get clear and to connect to nature and the messages that are our presents.....our presence on earth. I am deeply grateful for this amazing experience! Mahalo nui loa Angela." Angela, the piece you designed for me has changed my life. When I wear it the energy empowers me so that I speak my truth.... I love how you are directed by Spirit in all that you do. Thank you for blessing my life. "I received one of Angela's pendants as a gift and it soon became clear to me that this was no ordinary stone...I wear the pendant everyday as protection and a source of wisdom. Angela doesn't make jewelry she creates works of art that contain energy for healing, protection and insight. I recommend her works of art to everyone. Wear them and be transformed!!!!!!!! TALKING TO STONES WORKSHOPS schedule Angela Pohakuola as a speaker or workshop event . 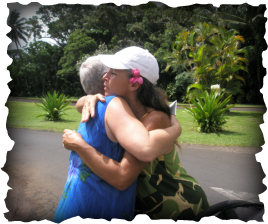 For HIDDEN OAHU SPIRITUAL RETREAT go to EVENTS/SEMINARS page.